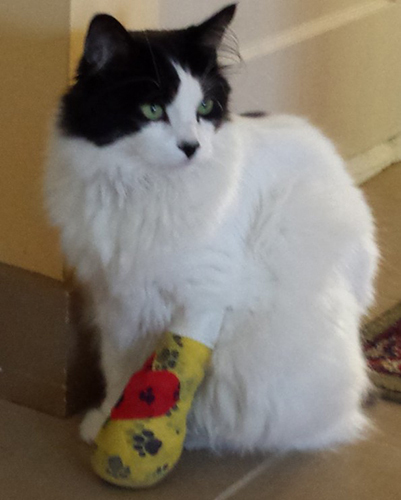 August’s patient of the month is ‘Piccolo’ Ralston, he is a 6 year old black and white long haired kitty. He was brought in by his mom as he had an accident at home where a table fell on his left front paw. When he came in he was limping and not putting too much weight on his paw. On exam he was very painful when his paw was examined. Dr. Dhillon recommended radiographs to determine the extent of the damage. With Radiographs Dr. Dhillon was able to see fractures of two phalanges (finger bones) on Piccolo’s left front paw. A treatment plan was drawn up where a series of splints and bandaging would be done at weekly intervals to Piccolo’s front paw and leg to keep it stable while his bones heal. Piccolo has been a pleasure to have in clinic, even though he still has some pain he allows us to resplint and bandage without any sedation. “My mom saw Piccolo at a barn at her neighbour’s farm in a small village in Quebec. She took him home to play with him but never had the heart to bring him back to an outdoor life in a barn. She brought him back to Vancouver on a trip home and gave him to me. He’s got a yard – and a whole neighbourhood – to explore in Kitsilano. He pays many of my neighbours visits and I’ve spotted him inside one neighbor’s window peering out at me on my way home from work – on several occassions. I was recently told by another neighbour she was woken up one morning this summer with the thud of Piccolo landing on her bed from her open bedroom window on the second floor. I’ve oftened called him a cat-dog because he is an incredibly social cat. He will often follow me for a block and a half when I walk away to run errands and he will often be found in the middle of my kitchen surrounded by friends when I have them over. Piccolo is also an avid hunter and will often bring mice in the yard where I have to watch him play or torture the mouse until I pry him away. That’s how he broke his paw. He waltzed in the back yard one evening with a huge mouse in his mouth and I stuck him in the house after I made him drop it. He was very busy running between the kitchen and bedroom windows trying to get a better look at his traumatized prey still lying on the ground. That’s when I heard a table in my bedroom tip over and I came in to find a bleeding and limping cat.